Happy #MerlotMe month! October is time to celebrate Merlot, one of the world’s premier wine grapes. Yes, of course a certain movie disparaged the grape, but that the means more Merlot for me! And others like you perhaps, who understand that Merlot can make some excellent wine that pairs well with many meats and cheeses. So we are focusing today’s Wine Pairing Weekend, hosted by Jeff at foodwineclick, on pairings for Merlot. Check out the #MerlotMe website for more on happenings related to the grape. I received 4 courtesy sample bottles from participating #MerlotMe wineries. As always, I give you my honest opinions of the wines regardless of the samples. I’m going to share about the wines in the order I tried them. Though it might have been fun to open them all at once and taste side by side, I opened mine over the course of a few weeks. 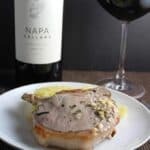 Below I share the #MerlotMe wines and the foods I paired with them, in the order I tried the wine. 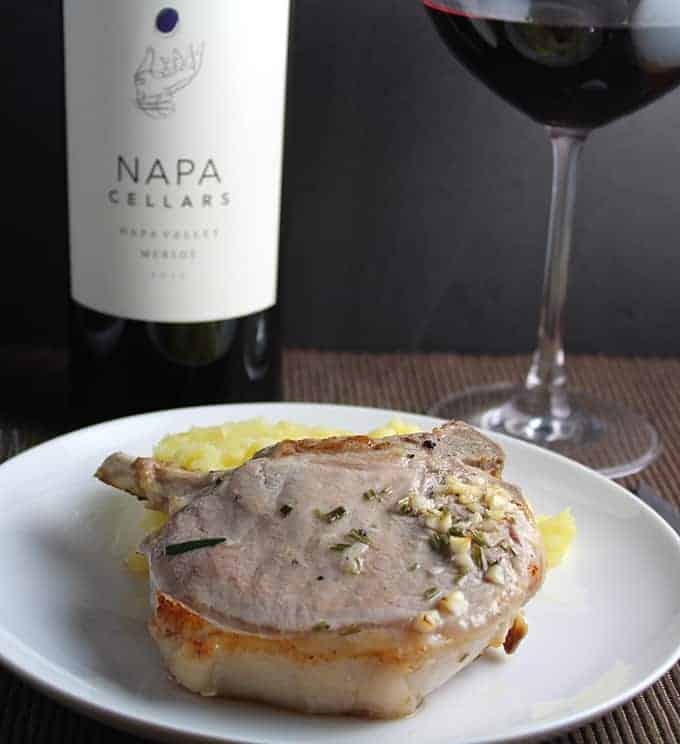 2012 Napa Cellars Merlot with Roasted Rosemary Pork Chops: Merlot generally tends to be a good wine to pair with pork chops, so I figured I’d feature the first wine and Roasted Rosemary Pork Chops. On the Napa Cellars Merlot ($24, 13.9% ABV) I got roses and chocolate on the nose (I know, sounds like Valentine’s Day!). Taste of cherry fruit, bit of tannins but on the light side. The wine paired fairly well with the pork chops, though other pairings this month worked better I’d say. The recipe for the chops follows at the bottom of the post. Rosemary is a nice flavor for pork, but if I made the recipe again I’d try to add a little something to give it more flavor. Or maybe feature the rosemary in a rub, as we really enjoy the flavors a good rub brings to a pork chop, as in our Heaven Sent Grilled Pork Chops. 2012 Peju Napa Valley Merlot and Spoon Roast: I had to do a Merlot and beef pairing for #MerlotMe month! 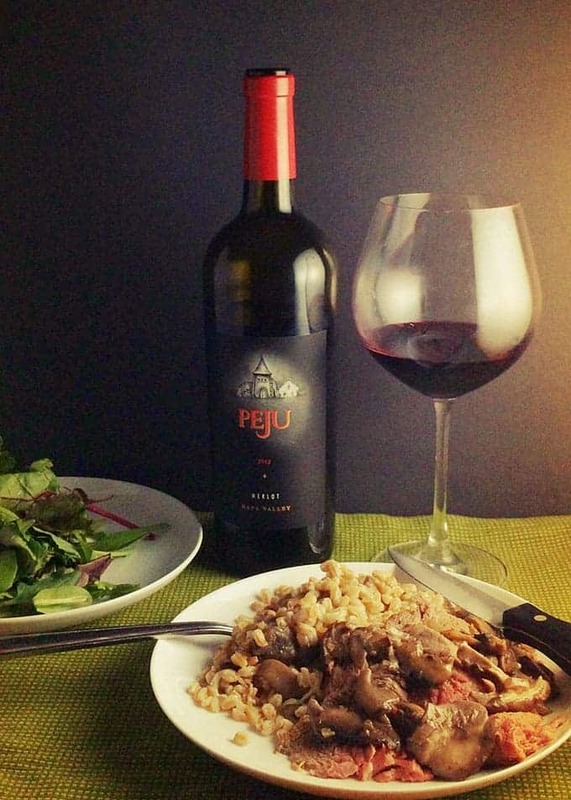 So we opened the Peju Merlot ($35, 14.5% ABV) to go with our Spoon Roast with Mushrooms and Farro. I got eucalyptus on the nose, cherry taste, refined finish. Paired well with the beef, but I also really liked the way it paired with the Seaside Cheddar Cheese we were nibbling on before dinner. 2012 Duckhorn Vineyards Napa Valley Merlot with a Cheeseburger: OK, not sure if we’re supposed to pick favorites, but I’m going to do so anyway! 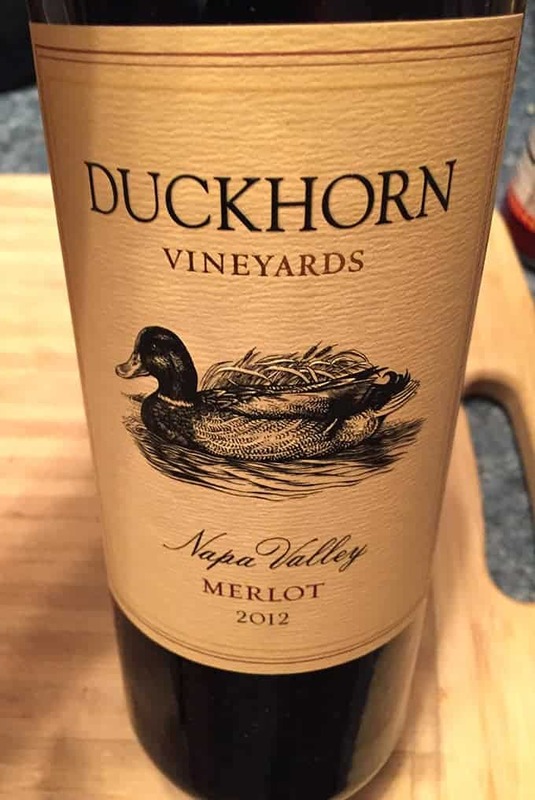 The Duckhorn Merlot ($54, 14.5% ABV) is a big red wine, with a bit more nuance than the others. Could be the grapes blended in with the Merlot, it is comprised of 88% Merlot, 7% Cabernet Sauvignon, 2% Petit Verdot, 2% Cabernet Franc, 1% Malbec. Drinking well now, this definitely could age a few years nicely. I anticipated this would be a good bottle, and thought it would be fun to serve with a simple cheeseburger…was not disappointed with the results! This was a basic cook the burger and throw cheese on it meal; for a somewhat fancier Merlot & burger pairing, check out our Gruyere Burger and a Bordeaux pairing from a #winePW past. 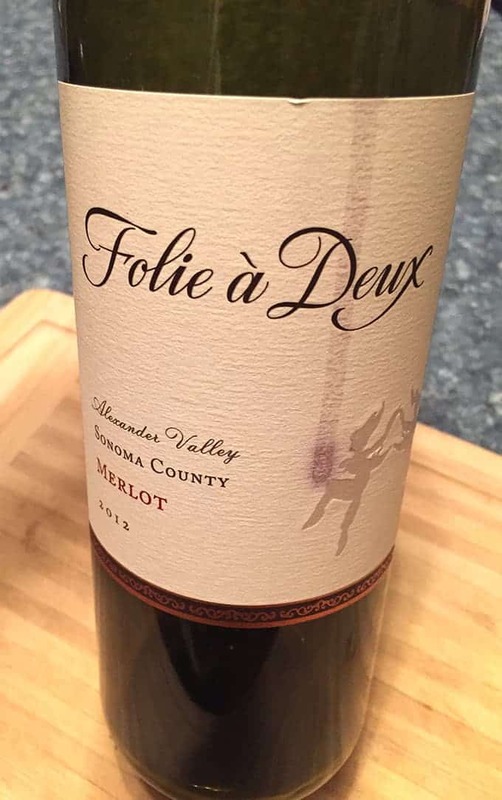 2012 Folie à Deux Sonoma County Merlot and a Sheep Milk Cheese: We wrapped up our #MerlotMe month sampling with the one bottle we had from Sonoma. The Folie à Deux ($20, 14.1% ABV) is well-balanced, cherry fruit with vanilla on the finish. Was very good paired with a sheep milk cheese from Spain. Definitely a good wine for the price in my book. #MerlotMe Musings: I like Merlot. One simple conclusion of the #MerlotMe tasting. Sure, I like complex blends and trying off the beaten path varietals, but a good, fruit-forward Merlot is a happy thing to have in the glass. I naturally think of Merlot with meat, but one thing that struck me doing these pairings is how good Merlot was with the cheeses we had. I’m going to file that one away for future pairings! OK, time to move on to the pork chop recipe to go with some Merlot. Recipe note: 10 minutes active prep time but you want to let the pork chops marinate with the rosemary mixture at least an hour. 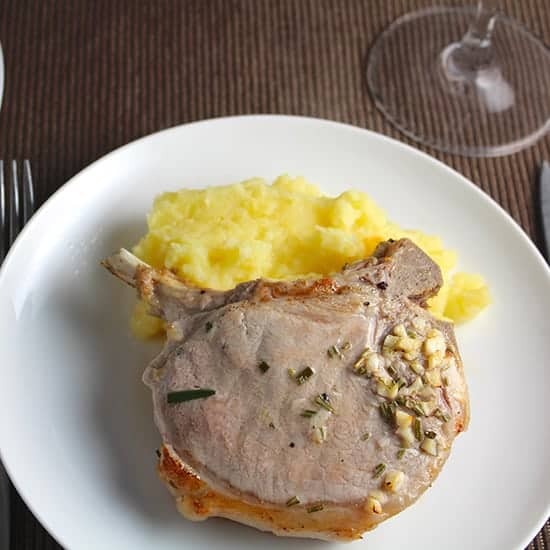 We served the chops with mashed potatoes, and definitely recommend that combo! Pork chops marinate in rosemary and garlic olive oil prior to roasting for a rustic flavorful chop. Combine the garlic, olive oil, rosemary, vinegar, salt and pepper in a bowl. Place the pork chops in a plastic bag and pour in the marinade. Seal the bag and toss gently to get the pork chops well combined with the rosemary garlic marinade. Put the pork chops in the refrigerator to marinate for 1 to 2 hours. Remove the pork chops from the fridge about 20 minutes prior to cooking. Heat an ovenproof skillet to medium high, spray with cooking oil. Take the pork chops out of the bag, gently shake to let the excess marinade drip off. Then place the chops in the skillet. Sear the chops for 2 minutes on one side, then flip and sear for another minute on the other side. Remove the chops to the oven. Roast for 13 minutes, check for doneness. Should be cooked through but still be very moist. If using a thermometer 135 degrees is when you should remove it from oven as it will come to the recommended 145 when resting. When done, remove from oven and let rest on a platter for a few minutes. 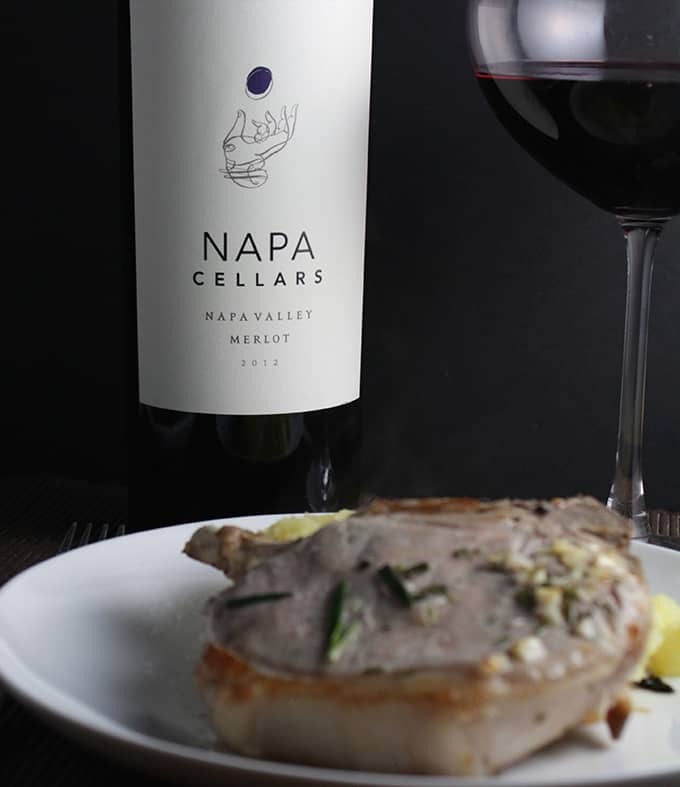 Plate the chops along with your sides, and a glass of Merlot is a nice pairing! See what all the Wine Pairing Weekend bloggers have cooked up to pair with their Merlot! Join our live Twitter chat on Saturday, October 10, at 11 a.m. ET by following #winePW. Be sure to tune in next month (Nov. 14) for our Creative Thanksgiving Pairings, hosted by yours truly. Check out upcoming and past #winePW event on the Wine Pairing Weekend page. Well we all seem to agree that the Duckhorn was lovely. You are right We don’t think about Merlot and cheese enough. I did a cheese and wine pairing and found the fruitier riper wines went well with the smoky cheeses. that’s a good nuance about the smoky cheeses working well. Yep, we all seem to say the same, the Duckhorn was a fantastic wine. Your food looks wonderful. I wish my pictures came out 1/2 as nice. These pork chops look so moist and delicious David! What a perfect pairing for merlot! Thanks Erin, pork and Merlot do go well together! This tasting was lots of fun and love the variety of dishes. Fantastic pairings! I was really happy we featured Merlot – it is such a wonderful & versatile wine to pair with food. Particularly love the Duckhorn & Cheeseburger pairing! Yes, the cheeseburger & Duckhorn was great! I was pleasantly surprised to find that I liked Merlots also. I had previously found them fruity and simple. Happy to be proven completely wrong! Love your pork chops recipe. I’ll try it soon, David. Thanks. Wonderful post David. Looks like the Duckhorn was very popular with the group (and for good reason Duckhorn is specializes in Merlot, and they’re quite tasty!) Love the pairings. I’m pinning the spoon roast farro one. Cheers! What a great way to enjoy the wines, with different pairing dishes. Your pork chops and roast both look delicious! Thanks Sarah, it was a fun way to do #merlotme month!